For twenty-six years Terry Bangen has coached hockey and nurtured the development of elite young athletes both on and off the ice. A flooded backyard, frozen ponds and outdoor rinks in Grande Prairie provided the context for Terry’s introduction to his favorite sport. He first coached at age 24, shortly after graduating from university. From this foundation in minor hockey, his career has taken him to positions behind the bench or in the front office of college, university, major junior hockey and to the NHL. Terry is a brilliant student and teacher of the game. He has tutored many players that have achieved their dream of an NHL career and he has served on the coaching staff of teams that have won three Memorial Cups and one World Junior Championship. His first recollection of skating was on the backyard rink his Dad had constructed. In a home with no water and sewer, they depended on Legend Leo Auger to flood the back yard rink while delivering water to the family. Later, Terry scrimmaged on rinks located on the Bear Creek Flats where the Museum is now located and where hockey-crazy kids of all ages participated in Grande Prairie’s minor hockey program. It was teeth chattering cold but it was free. Terry’s role models and heroes included Grande Prairie “Hall of Famers” Ken Head, Bob Neufeld and Leo Auger. Terry loved to play hockey but he was more comfortable behind the bench than on the ice and today he stands among the elite of coaches. In the process of preparing himself for coaching, he has attained the highest possible coaching credentials, coached winning teams at every level of the game, and gained recognition nationally and internationally. Most importantly, he is unusually skilled at judging talent and fostering the development of young people including the preparation of young men to deal with stardom, multi-million dollar contracts and the many other pressures associated with professional status. Sherwood Park Alberta, Kamloops BC, Mc Gill University in Montreal, Vancouver BC, and two stints in Kennewick Washington are locations that frame his coaching story. At the junior level he mentored Doan, Iginla, Tucker, Sydor, Neidermayer, Baumgartner, Gomez and later with the Canucks he coached Naslund, Ohlund, Bure, Mogilny and Messier. Over the years he shared the bench with the likes Tom Renney, Ken Hitchcock, and Don Hay. Terry was a Playoff Scout for the Dallas Stars and he served as Western Scout for International Scouting Services and on the scouting staff for NHL Central Scouting, an organization that identifies and evaluates young hockey prospects for the benefit of all NHL teams. For several summers, he instructed at the New York Ranger’s Development Camp and he recently consulted for the television reality show, “Making the Cut”. Hockey Canada, the governing body for hockey in Canada regularly draws on Terry’s expertise. The mission of Hockey Canada is to lead, develop and promote positive hockey experiences and it delivers internationally recognized programs for players, coaches, officials, trainers and administrators. Under the sponsorship of Hockey Canada, Terry at various times has appeared behind the bench or served as general manager of under 17 and 18 teams competing in international tournaments. Highlights include winning gold medals in 1989, 1994, and 2001. He was on the coaching staff of Canada’s National Junior Team that won gold in Boston in 1996 and he was behind Canada‘s bench again in 1998. From 2000 to 2005, he worked for Hockey Canada in a number of roles including Manager of the High Performance Program and helping to revamp the National Coaching Certification Program. Terry is a certified level four coach as designated by Hockey Canada, and a Chartered Professional Coach as recognized by the Coaching Association of Canada. In 1987, he received the Coaching Excellence Award of the Canadian College Association. 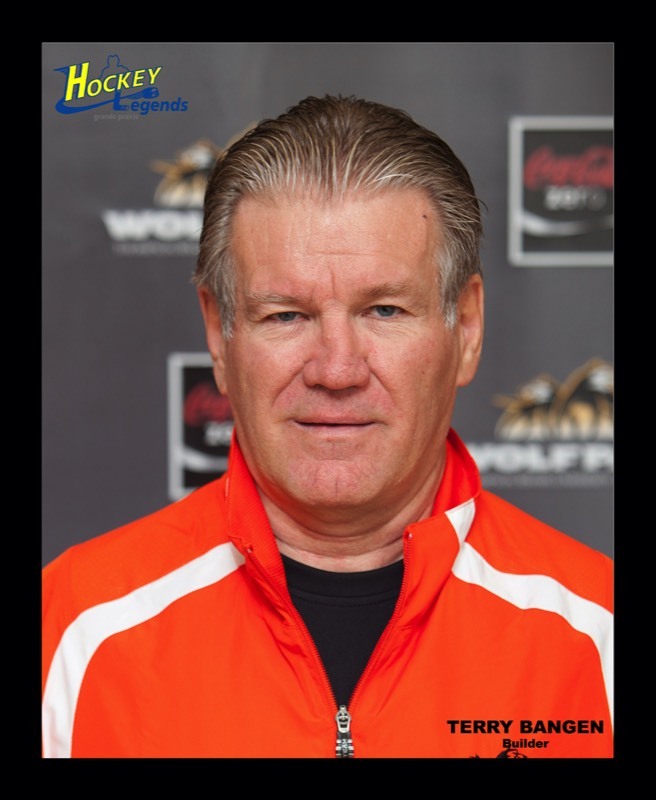 Terry Bangen - a Grande Prairie Hockey Legend in 2008.